Gamescom 2018 is in full swing this week and among the many games that are playable there, the Nintendo Labo: Vehicle Kit also had its own demonstration model. The folks over at Kotaku had the privilege to get hands-on with the new Labo kit and have shared some new details about it. Players can explore a large area that is sectioned into themed zones in Adventure Mode. You can switch between controlling a car, a plan and submarine (where there is water). The world is large but not to the extent of Breath of the Wild. It is more on par with the likes of Wii Sports Resort. The themed zones are based on real life settings. There are city zones, meadows, deserts, etc. The in-game chararcter is an androgynous crash test dummy. There is a multiplayer mode that features car racing and a battle mode. Each vehicle has a type of armament. The Plane fires missiles, the Submarine uses torpedos and the car has… bombs?! 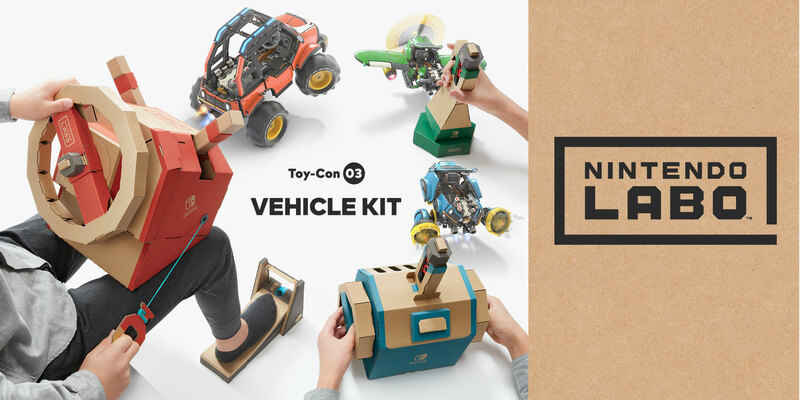 If you would like to see some gameplay footage of the Nintendo Labo: Vehicle Kit, you can find some over at the Kotaku website. Feel free to check out the first look video in one of our previous articles.